George Harrison graduated from Teesside University in July 2018, but before he had even completed his final assignments, he had already secured a role at Middlesbrough Football Club. 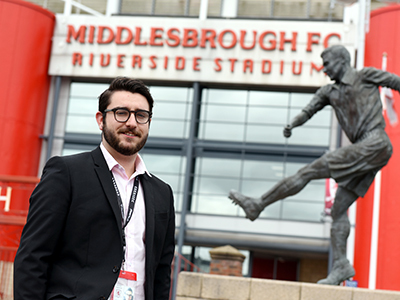 Born and raised in Middlesbrough, George now works as an Archivist based at the Riverside Stadium. In his new job, George collates items and information considered of value and inputs them into a system to be archived. The items can include Middlesbrough Football Club memorabilia, such as shirts, trophies, letters and programmes. George said: 'Some of the items are of fantastic historical significance. For instance, recently I have archived player contracts from days gone by where players were paid just £15 per week. George is enjoying the variety that his work brings and since starting in June he has had the scope to change the display cabinets within the stadium, adopting different themes throughout the year. 'During the 2018 World Cup, I centred the displays around the World Cup theme. In the 1966 tournament, Middlesbrough’s old ground, Ayresome Park, hosted some of the games so there was some interesting correspondence to the Club around this time,' George said. As part of his role, George also attends every home fixture played at the Riverside Stadium and is able to support the Club’s media team during the matches. George, who studied BA (Hons) Journalism (Sport), says that he has been able to use transferable skills he gained on his degree in his career so far. He added: 'Although I studied journalism, the research skills I developed during my course have definitely helped me in my role as an Archivist. 'I also took part in live projects, such as building a sports website, which allowed me to put what I had learned into practice.